Wash and soak rajma overnight. Pressure cook rajma with salt and enough water to soak the rajma. 1. Heat 2 tsp oil in a pan. Add mustard seeds to it. 2. Once they crackle, add turmeric powder and finely chopped onions to it. Saute until light brown. 3. Add ginger-garlic paste and pureed tomato. Saute it . 4. Next add slit green chilies to it. Saute until oil starts leaving from the sides. 5. Add coriander powder, cumin powder, 1/2 tsp garam masala and rajma masala powder. Saute the mixture. 6. 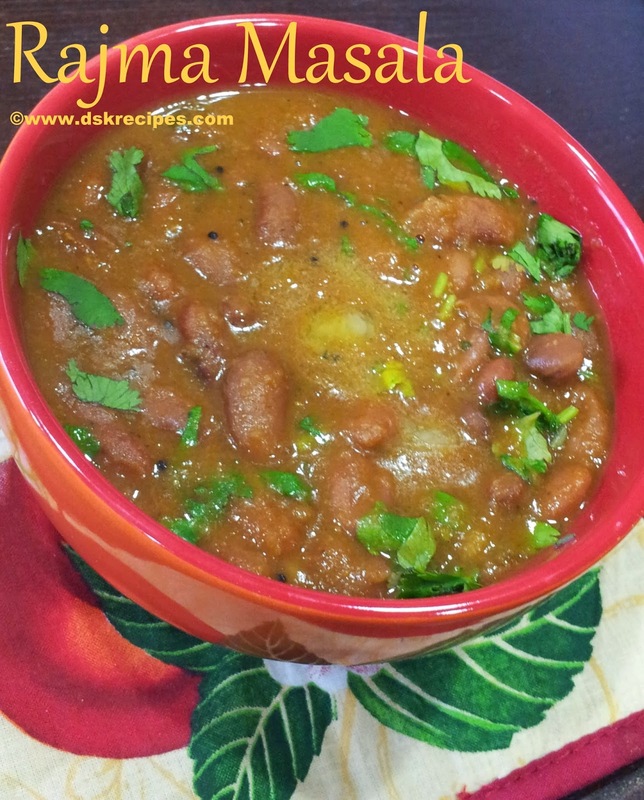 Add the boiled rajma to it along with the water in which the rajma was boiled. Mix all the ingredients. 7. Add salt and chili powder and cook it for around 15 mins with the pan covered. 8. Now add the remaining garam masala powder and switch off the flame. 9. Finally garnish it with chopped cilantro and serve hot. Thanks to Devika Kulkarni for sharing the recipe.